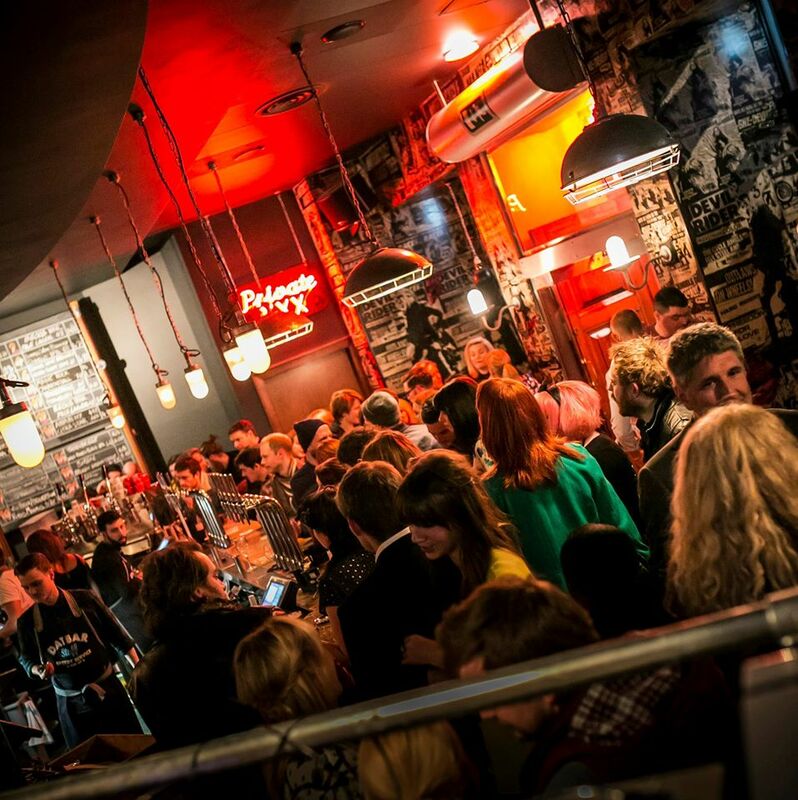 In a bid to banish the holiday blues KIRSTIN HANNAFORD finds that dAtbAr in Newcastle hits the mark! My husband and I have recently returned from seven glorious days of sunshine in southern Spain. We enjoyed a fantastic break from the daily grind; a welcome escape from the office for me and a well-deserved rest from the kitchen for him. Now back in Gateshead with the temperatures barely scraping double figures and the prospect of another full week at work looming for us both, he wasn’t in the mood to cook and we needed a treat to ease the pain of being back to reality. And so we found ourselves in central Newcastle on a busy Saturday night amidst the chaos that inevitably ensues the day after payday, on a mission to seek out some good grub. ‘dAtbAr’ on the corner of Market Street next to the Theatre Royal wasn’t necessarily the obvious choice, but as we strolled down from the Monument and it started to rain, the bright neon sign above the door caught my attention and we decided to dive inside for cover and peruse the menu. We were greeted immediately by a young friendly waitress who directed us from the bar area to an inviting looking booth in the dining section and took our drinks order. 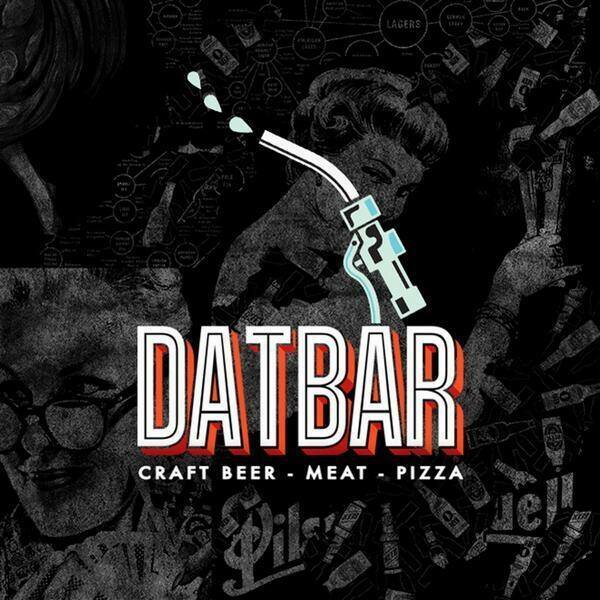 I had always thought of dAtbAr as a bit of a hipster hangout and inside it certainly has a young and trendy feel with an open kitchen at one end, and a quirky, arty interior which lends it a relaxed, creative atmosphere. 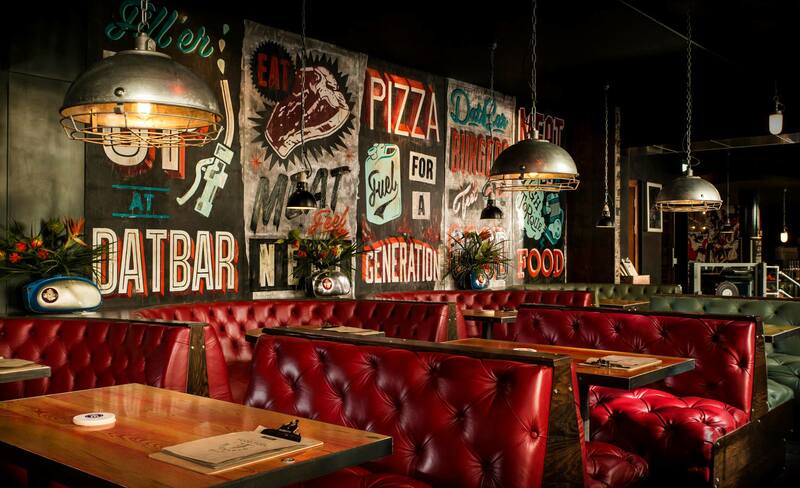 You can’t fail to miss the comic book-style wallpaper and array of modern artwork adorning the walls. With my eyes still focused on the décor, predictably the other half was already dismantling the brown paper menu from its clipboard to see what was on offer. Unless you’re edible, it can be difficult to get a chef’s attention at the best of times and when he’s hungry and keen to scrutinise his competitors, it’s virtually impossible. The menu boasts a range of small platters, sliders, sourdough pizzas, ribs, steaks and burgers and as my eyes scanned the options I felt my appetite increase. It’s quite meat focused and the impressive looking mix-and-match charcuterie boards are prepared using a vintage Berkel slicing machine. Veggies are not forgotten either with a number of meat free pizza and salad choices. After much deliberating we opted for a couple of the ‘small plates’ to start. 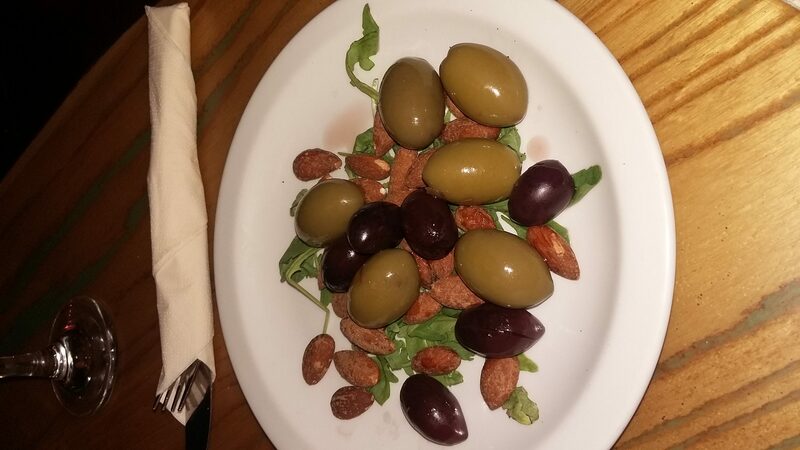 I ordered Cerignola olives with roasted salt almonds and rocket while he went for the meatball slider, billed as a pine nut and raisin beef meatball in a ‘soft milk bun’. With the open kitchen in clear sight it was disappointing to see our starters sit on the pass for over ten minutes before they arrived at our table. Not something I would have noticed had I not had a hawk eyed culinary expert by my side providing a running commentary on the number of dishes going out before ours. When they came, my gigantic green olives were bursting with flavour and partnered extremely well with the salted almonds serving as a tasty and light appetiser. Unfortunately, the other half wasn’t quite so happy with his slider as he bit in to the ‘soft milk bun’ only to find it was rock hard – presumably due to its time spent under the hot lamps of the serving hatch. With a steady flow of diners on a busy Saturday night, the two waiting staff had their work cut out. To their credit they were rushing about trying their best, but with so many hungry customers they certainly didn’t have time for a check back to see if our meal was ok – which I’m told is a must in the restaurant world. After the debacle of ‘starter-gate’, I was worried that it might all go downhill, however, I was quickly proven wrong when we were presented with a feast for two that even impressed Mr high standards chef! 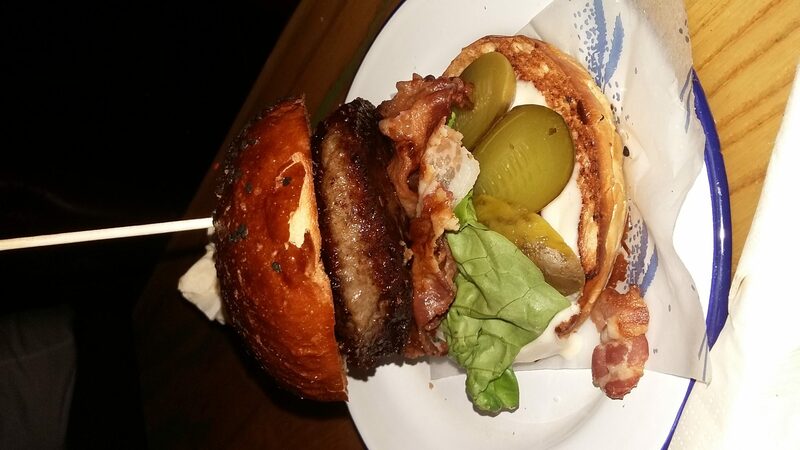 The meat is taken very seriously at ‘dAtbAr’ – they make their burgers from beef supplied by Northern Ireland based Hannan Meats where they age the beef inside a 12-foot high vault of Himalayan Salt bricks to give it a distinctive flavour and texture. Naturally I was keen to sample the goods first hand. My Joe burger came with baby gem lettuce, large slices of beef tomato, gherkin, crisp pancetta and a creamy Dijon mustard sauce that had a pleasant but not overbearing kick. Served medium rare at my request, with a side of shoestring fries, it definitely hit the spot and the beef patty lived up to expectations with a unique, almost gamey flavour, encased in a soft brioche bun that bore none of the texture issues we’d encountered with the starter. The husband opted for a pizza. I’m told that the perfect pizza relies on a good pizza oven and an even better pizza chef. A pizza chef that knows what they’re doing and manages to do it well is worth their weight in gold and apparently dAt bAr have hit lucky. My other half’s Ava Rose pizza wasn’t a choice I would have made, but I have to admit the melty beef ragu sauce topped with loads of parmesan on a huge slow risen sourdough base had my mouth watering with food envy. To my relief, it was a resounding success with him too and what he couldn’t manage got boxed up and taken home for my supper. After several attempts to get the waiting staff’s attention I ordered a second round of drinks; for me, another glass of Shiraz and for him, a pint of Heineken. Call us philistine’s if you wish as the drinks selection is vast. There’s a rotation of 20 draught beers behind the bar from UK brewers and beyond, providing a real treat for anyone that knows their Beavertown Smog Rocket from their Brooklyn lager. It’s not all about the beer though – there’s also a good selection of ciders and wine and a pretty impressive looking cocktail menu. With no room left for desert we asked for the bill and to be honest £46 for two courses and two drinks each felt like pretty good value. Yes, the service was slow, but with a couple more waiting staff that wouldn’t have been a problem and although the starter was disappointing the main event made up for it. The verdict? Great food, in a vibrant atmosphere and even with a few minor hitches, it still more than succeeded in easing the post-holiday blues.